Born in a small village Thuhi, Jagjit studied up to college at Nabha; did B.Sc. ; Masters (in Eco. Edu. ; Commerce) & L.L.B. 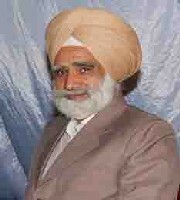 He served as Lecturer in Commerce for 18.5 yrs.He started writing in Panjabi when at school. He never tried to develop poetry as a talent, but kept writing discretely. Death of his wife & only son made him to pour out his pains through his verses besides caring & raising his three daughters with sheer affection. On meeting friends like Greek Poet Chryssa Velissariou who inspired him writing in English. She presented his poems through video presentation in 2013, 2014 & 2015 at Larissa (GREECE). His English poems have been published in many International Anthologies. His verses appear to be coated with religious flavor that he inherited from reading GURBANI from SHRI GURU GRANTH SAHIB JI daily. Spiritual thoughts seem to be flowing out of his poems. His poems seem to sing songs of salvation as he seeks serene love but doesn’t love money & property. Journey of Love to Salvation is his debut book and one may really feel the pleasures of love leading to salvation, pouring out of his serene poems. May God, bless him with peace, love& eternal light to make his journey of life more happy & successful.